However, it is now time to really start training for it so that I can actually manage to run it in June. I have made a very clear plan for which sessions I need to do each week up until the race. The aim is to build endurance rather than trying to run faster. I don’t know how my body will cope with running that long and under which conditions I will be running on the day so I feel that setting a time goal would be unnecessary for me personally. Maybe if I run another marathon I can set a time goal when I have the experience. I am very much looking forward to it and I know it will be tough and amazing at the same time. Right now I am in Tettnang, Germany and I will try to follow my schedule here as well. I had a long run planned for today, 120 mins. I did 105 mins in the end, because I got a bit of pain in my ankle (I think I stepped awkwardly on a pine cone), but it felt good otherwise. I did 18 km and had no cramp in my legs. 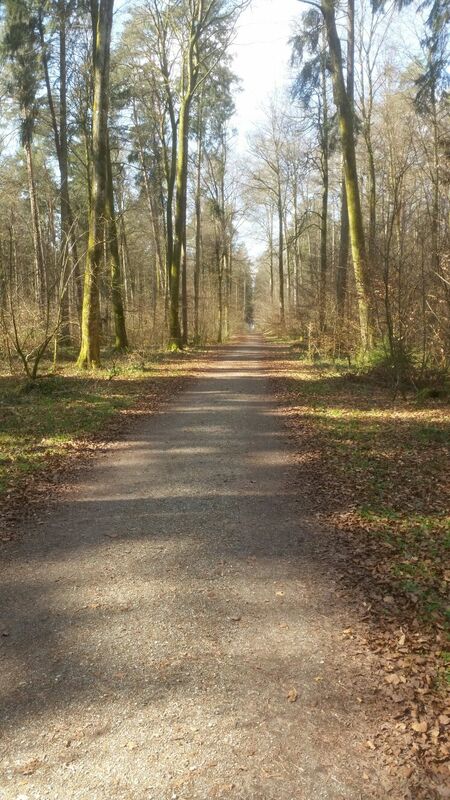 From my long run today – had the forest to myself! It is beautiful here, we are right next to Lake Konstanz (Bodensee) and you can see the Alps when it is clear.